James Grasty is a seasoned entrepreneur, starting his first business while still in high school at the age of 18 and currently working on his 6th at the age of 34. He currently owns 2 businesses; Designated Driver inc., as the name would imply it is a designated driver for hire company that takes would be drunk drivers home in their own cars. He, with his 2 partners, own TheBroBasket.com, an online retailer that offers custom alcohol themed gifts baskets geared towards men. There, James is considered the jack of all trades, in charge of marketing efforts, product design and creation, web presence, strategy, inbound logistics, information technology, and just about everything in between. 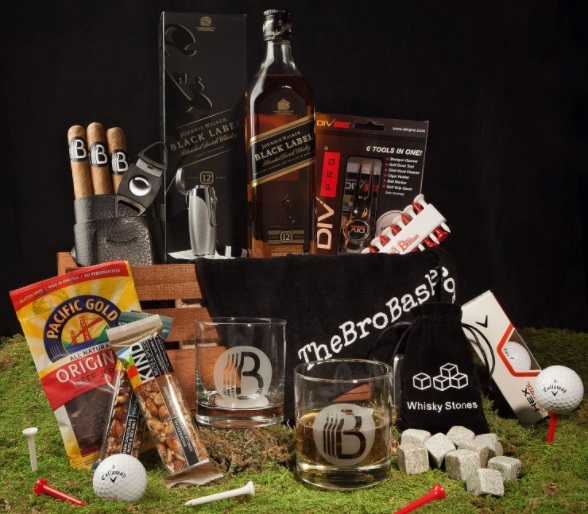 Today, The BroBasket.com is a successful e-commerce site offering customizable alcohol themed gifts baskets for men, including a wide variety of beer, spirits, and wine. A nice selection of non-alcoholic baskets is also available. From 2015 to 2016, BroBasket grew over 500% and is expected to bring in revenues of over $2 million this year. I’d like to think that I am great at business strategy and delegation. When it comes to strategies in general, I feel that I have a constantly evolving one for most aspects of my life. If I am focused and working hard towards a strategy that I have thought through I will most likely succeed. Planning and details are not my strong suit, but crafting and executing strategy is. For that reason, I rely on delegation so others that are great where I am just good or mediocre can excel and I can focus on strategy execution and other tasks that I am great at. I'm kind of obsessed with knowledge. The more I can have of it, the better. I’ve always loved school and reading, when I have time. I even went and got an MBA just to cram more into my head. I’m constantly on a quest for new and interesting knowledge and being in digital marketing and ecommerce there is more out there than anyone would have time to sit down and learn. So, I am constantly reading blogs, articles, listening to podcasts, and just trying to know a bit about anything and everything that interests me. I would say what makes me the best, is that I know a little bit about everything, which makes me a great delegator and leader. I’m also a solid partner at your local trivia night. I can effectively manage and lead a team of in-person and virtual people all in various fields because I know a little bit about what each and every one of them does. I can help craft the best strategies, whether it’s producing X amount of product to fill Y amount of demand or identifying what the ideal customers are to target on a certain marketing channel. What drives me is to give value to people, our customers, partners, employees and myself. If I can give all of these people value and have a great time doing it, then what else could I ask for? My ultimate aspirations are to keep providing better value to all of these people through expanding my current businesses and maybe starting some new ones. I look at people that may not be gainfully employed or they do something they really hate and ask myself “Do I ever want to be in that position?” The answer is no. I want to give and receive value for my hard efforts. Personally, I want to maintain a lifestyle that allows me the free time to travel and take care of my future children, as well as being able to spend time with my loved ones when I want to. If I am working so much that I cannot spend my time the way that I want, then it better damn well be worth it! When I started a Designated Driver business at 24, I didn’t have grand plans to take over the world or anything, I just wanted to have a successful local business that would help some people out and allow me to be gainfully self-employed. Fast forward to now and it’s been open 10 years. It blows my mind! We have been through lot of ups and downs and my current business TheBroBasket.com is a lot more financially successful, but it just feels great to have made something from nothing. I took an idea, a small amount of capital and through hard work, and a little luck, I made a full time living for myself… a good living for people who work for me and keep the streets a little safer.. What more could a guy ask when finding their own success? Another great success is growing TheBroBasket.com to over $1 million in 18 months. In the first quarter of 2015, just a few months or so after we launched TheBroBasket.com, we were up against a wall. Running out of money and little to no sales coming in, we were headed to a quick and utter business failure. But hey, they always say to fail fast I guess. We decided we needed to pivot into being a national ecommerce player and start going after a larger audience than we first sought out. With that shift, we finally started to see the sales roll in, not enough to get us completely out of the hole, but enough for us to get approved for the financing we needed to launch a new and improved website, as well as investing in the right kind of marketing. We came within a few weeks from having no money in the bank and owing a few people a lot of money to now, where we are about to pay back our original seed investors with our loan not too far behind. Consistency rules everything around me. I, like a lot of entrepreneurs, suffer from ADD, which can really be great for starting and growing businesses if you know how to harness the power of it. The downside is that it really makes it hard to focus on one thing at a time. There are just so many cool ideas I would love to fully explore and so little time. Over time, I realized that constantly starting new things is not the ideal path to success, like running in place. So, for me coming to the realization that if I want to see results and make some real change in my business ventures, and the world, I would have to seek to do things constantly. Trump... JK, Elon Musk… what entrepreneur can’t love that guy?! I haven’t read his biography (yet) but from what I know about him and how he is described, he just thinks the world is a bit irrational and instead of trying to wait for it to change he set out to change it himself. I’m not saying that I’m over here changing the world, but like to think I don’t wait for life to come to me, I seek to go to it and love creating something out of nothing. I have two products that instantly leap out in my mind; my Pebble Smartwatch and my Asics Trail Runners. If you own a business, you really need that smartwatch on your wrist, it really helps keep your sanity. When that phone goes off you have to check every email, text, phone call that is CONSTANTLY coming in (especially around Christmas for me) to make sure it is not a customer, vendor, or some emergency. With a smartwatch, it really frees you from being locked on that phone screen half the day, the way I describe it to people is that it helps to ignore the unimportant and pick up that phone when it is or when you have free time to scroll through your notes. My Asics trail runners I bought thanks to a Zappos gift card at Christmas (thanks Aunt Mindy), and boy they have seen some use! I hike and travel a lot, but traditional hiking shoes are bulky and uncomfortable when doing anything but hiking, maybe even hiking! These things are comfortable like your regular tennies but are slightly more rugged with a mean grip on the bottom. You can really get away with traveling with only these things if you are a super light traveler like me (back pack only bro). They have gotten me through things like snow / ice from the Grand Canyon & Iceland, sand covered rocks in Utah, and running through an airport trying to catch a flight. I didn’t get to travel much in my younger years; working day and night on a business from 24. Now that I have really tried to design my business and life around having more free time to pursue the things I love to do, I have really doubled down on traveling over the past two or three years. So as long as the holiday rush isn't hitting TheBroBasket.com, I normally go on a trip with my Fiancé once a month. Seeing the world around you is very important to me and I feel more people should make the time to do so. The BroBasket concept began in 2013, during an entrepreneurial class project at the California State University, Channel Island’s MBA program. The idea came forward when one project team member recognized a gap in the market for men’s gifts. Her fiancé had sent her a bouquet of flowers and she wanted to send him a bucket of beer back as a thank you. After searching the internet and quickly realizing that she couldn’t send him a bucket of beer. she told her teammates and they realized what a cool concept that would be! The seed had been planted for what would eventually become TheBroBasket.com. The whole class got A’s and they left with a sense of accomplishment. After the class concluded, the original four VP’s; Mike, Pete, Kenneth, & James (Mike, Kenneth, and James being the current owners), and a handful of other students really believed in the idea and thought it could be turned into an actual business. They continued to meet regularly and worked on all the aspects of the business plan that needed more attention. Over time, a few class members fell off, but the remaining team vowed to give anyone that opted in a little piece of the company, as an ode to the original class and their hard work. When they finally had a more refined business plan in order, the team set out to secure the funds needed to turn their idea into reality. They prepared a presentation and invited friends, family, and of course, everyone that was in that entrepreneurship class. This presentation netted them a few thousand dollars from a couple of classmates. This was not enough to launch the business, but it was a start and it gave them hope. With the help of some family, the team continued to raise enough money to obtain a location, licenses, some initial inventory, and most importantly to have a website built. It took over a year and a half, many man hours, lots of coffee (and beer), and numerous delays, but on December 12th of 2014, in the middle of the Christmas rush, TheBroBasket.com was launched as a local drinkable gift basket delivery service geared toward men, Then, the strangest thing started to happen, BroBasket kept getting orders from all over the country! The guys quickly realized that local sales would not sustain the business, but since people kept ordering from all over the nation, the light bulb went off! With the help of an SBA backed loan, they shifted their business model. They launched a new and improved website, started advertising their products nationally and came up with cool new ideas like Customize Your Own (their biggest seller).